Jeff has been an incredible sport so far, withstanding hours at the Louvre, copious litres of wine and even Serge Gainsbourg. So when he wanted something with hot sauce, no easy feat to find here in Paris, it was the least I could do to honor his request. 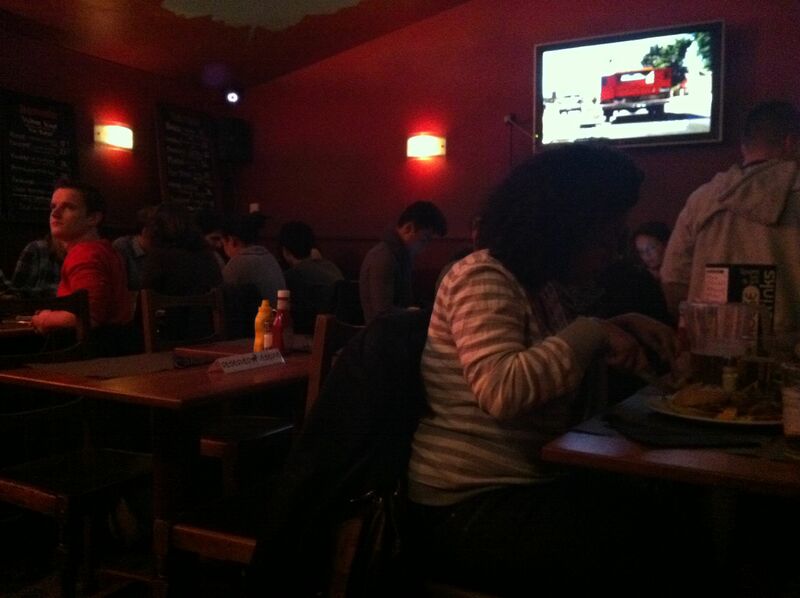 After walking past countless bistros and sandwich stands not fitting the bill, we finally found a noisy little pub called The Moose, which we had read about earlier as a place that actually showed NCAA football and other sporting events. When I saw they served poutine, that delicious Canadian delicacy of french fries, meat gravy and cheese curds, I gave my stamp of approval (Street Meat needed a new post too!) We wanted something American, but we would settle for North American. 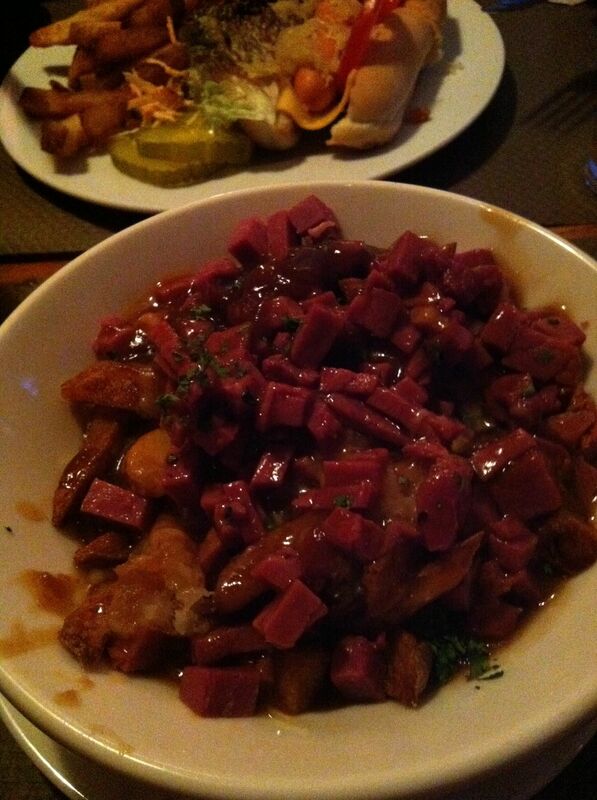 One Montreal-style smoked meat poutine, a Bloor Street hot dog, a pitcher of Strange Brew beer, and half a bottle of Tabasco later and we were off for part two of Saturday night in Paris, American-Style – Real Steel! I think I was already over here when the robot-fighting feel good movie of the fall and tale of father-son redemption had opened to big box office, but the reviews were overwhelmingly positive, we were mildly curious, and if we couldn’t watch Michigan State pummel Wisconsin, we could go see a bunch of robots bash each other to pieces. And you know what, it was pretty darn good! We were expecting schmaltzy, and we got it, but it didn’t hit us over the head either, the kid lead was kinda cute, and the robot fights were pretty freaking awesome. And Hugh Jackman finally renewed his macho bonafides after years as a song and dance man on Broadway and at the Oscars. If you’re going to see one robot fight movie this year, make it this one! We have some Canadian friends and he tells me about this POUTINE all the time. I have never had but it’s on my list of things I need to eat and/or cook! Adding smoked meat sounds awesome. I was thinking adding some nice crispy pork belly would be good. I have one on th freezer waiting to be cooked! 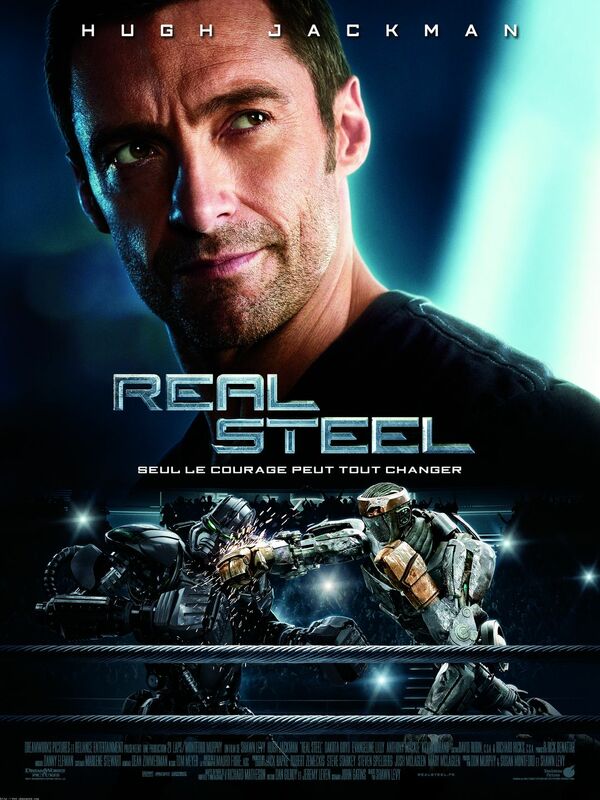 As for Real Steel I have not seen it but I thought it sounded a little tacky, robots fighting….. come on 🙂 I will have to chaeck it out when it hit netflix. Hard to go to the movie with 2 kids!